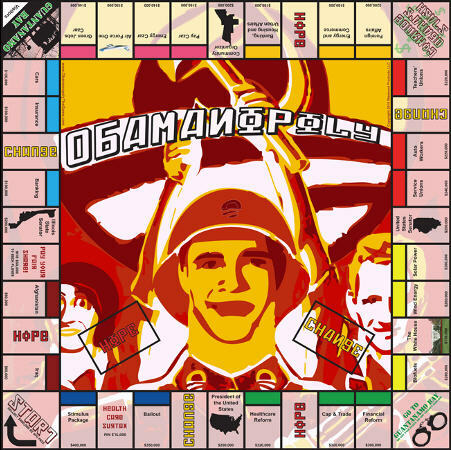 Most satirical board games don’t make it past the blog post stage, but Obamanopoly is available for pre-order for $15 ($995 if ordered by a government employee). The game is by Weekend Products, makers of a floating beverage cart. It’s Monopoly, of course, with various jabs and pokes at liberals and other such communists on the way. At the end of each turn, the player with the most money or property has to take half of it and flush it down the toilet. Game ends when none of the players have any money or property left. Guess they got a C&D letter as it doesn’t appear on their website anywhere… anyone else see it? No C&D letter. We host it at http://www.obamanopolythegame.com. It doesn’t really fit with our other product lines, so the game got its own website! Thank you for pointing out this confusion. We will be sure to add a link or some kind from the main weekendproducts website. I’ll throw down the gauntlet here – that ain’t satire. That’s lazy propaganda. Lazy in both creativity and message. Shame, because we do need more political and satirical games out there.